A recent attention-grabbing headline is wrong. The headline is wrong, even though Layton gets the facts pretty much right: 51 percent of kids are eligible for free or reduced-price lunches, which are available only to low-income families. That’s an important story. But participation in the federal lunch program is, as she notes, only a rough proxy for poverty: you qualify if you have a family income less than 185 percent of the poverty line. For a family of four this comes to about $44,000, which certainly qualifies as working class or lower middle class, but not poverty stricken. School lunch programs do not accurately measure poverty, and poverty rates have not changed much over the long term. But wait! It’s even more complicated than that—and this part is important. On the one hand, lots of poor kids, especially in the upper grades, don’t participate in school lunch programs even though they qualify. They just don’t want to eat in the cafeteria. So there’s always been a bit of undercounting of those eligible. On the other hand, a new program called the Community Eligibility Provision, enacted a couple of years ago, allows certain school districts to offer free meals to everyone without any proof of income. Currently, more than 2,000 school districts enrolling 6 million students are eligible, and the number is growing quickly. For example, every single child in the Milwaukee Public School system is eligible. Overall, then, although the official numbers have long undercounted some kids, CEP means they now increasingly overcount others. Put this together, and participation in the school lunch program becomes an even rougher proxy for poverty than it used to be—and any recent “explosion” in the student lunch numbers needs to be taken with a serious grain of salt. This is especially true since overall child poverty hasn’t really changed much over the past three decades, and if you use measures that include safety net programs it’s actually gone down modestly since the end of the Reagan era. Economist Alex Tabarrok points out that about 20% of school-age children live in poverty according to several other measures. Obviously poverty is a serious problem that should not be ignored, and the causes are probably complex. But inaccurate reporting does not help in finding solutions. 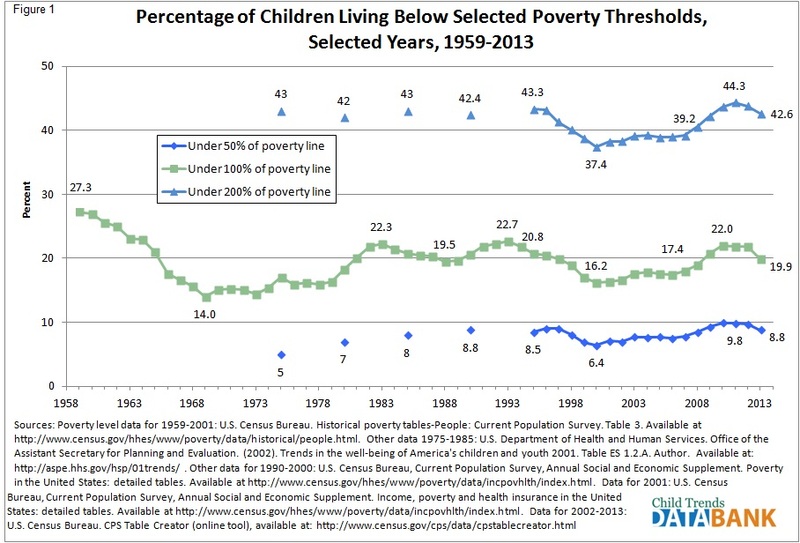 It’s certainly worthwhile discussing why poverty has increased. The economy is one possible reason as are issues to do with family formation and marriage rates. Another possibility is immigration. A higher poverty rate caused by the immigration of more low-income children is compatible with everyone becoming better off over time and not necessarily a bad thing. Those are just a few possible topics worthy of investigation. I don’t claim that any of them are correct. I do claim, however, that we won’t get very far understanding the issue by shifting definitions and muddying the waters with misleading but attention grabbing statistics. Kevin Drum, “Half of All Public School Kids in Poverty? Be Careful.”, Mother Jones, Jan. 17, 2015. Lyndsey Layton, “Majority of U.S. public school students are in poverty”, Washington Post, Jan. 16, 2015. Alex Tabarrok, “No, A Majority of US Public School Students are Not In Poverty”, Marginal Revolution, Jan. 17, 2015. Children in poverty, Child Trends Databank, 2014. Even an advanced college degree does not guarantee a living wage, as explained in a recent Elle article about the “hypereducated poor”. … The number of people with graduate degrees receiving food assistance or other forms of federal aid nearly tripled between 2007 and 2010, according to the U.S. Census. More specifically, 28 percent of food-stamp households were headed by a person with at least some college education in 2013, compared with 8 percent in 1980, according to an analysis by University of Kentucky economists…. It’s not just academics who are highly educated and downwardly mobile. Employment for recent law school graduates fell from 92 percent in 2007 to 84.5 percent in 2012, according to the National Association for Law Placement, and the average law student’s debt was about $100,000. Other professions that haven’t regained many of the jobs lost during the recession include architecture, market research, data processing, book publishing, human resources, and finance—all of which either require or tend to attract workers with a master’s degree. The article profiled Brianne Bolin, who “thought her master’s degree in English would guarantee her at least a steady income”. It wasn’t supposed to be this way. Bolin, the English major, knows that’s a cliché, but she can’t help thinking it all the time…. Bolin’s story is poignant, but if she were more willing to take personal responsiblity for her predicament I might be able to summon up more sympathy. “My dreams did this to me.” That’s one way to put it. Apparently her dreams compel her resistance to taking on a “mundane” job that pays the bills. And her dreams compelled her to become a single parent at age 28 as “the result of a random hookup with a 20-year-old in a band she liked”. Brolin’s education puts her far ahead of many other welfare recipients, but unfortunately she seems unable to push herself out of poverty. Sadly, it appears there is no one in her life who can help her answer the question she has when she sees self-supporting families who can afford comfortable lives. Alissa Quart, “Hypereducated And On Welfare”, Elle, December 2, 2014. Robert Samuelson writes that the War on Poverty has been a “success at strengthening the social safety net” but a “failure as an engine of self-improvement”. The War on Poverty is often branded a failure because the share of Americans below the official poverty line has barely budged. In 1982, at the end of a harsh recession, it was 15 percent. In 2010, after the Great Recession, it was 15 percent. The trouble is that the official poverty rate is a lousy indicator of people’s material well-being. It misses all that the poor get — their total consumption. It counts cash transfers from government but not non-cash transfers (food stamps, school lunches) and tax refunds under the EITC. Some income is under-reported; also, the official poverty line overstates price increases and, therefore, understates purchasing power. Based on material well-being, the poverty rate is actually only about 5%. Eliminating these defects, economists Bruce Meyer of the University of Chicago and James Sullivan of the University of Notre Dame built a consumption-based index that estimates the 2010 poverty rate at about 5 percent. People at the bottom aren’t well-off, but they’re better off than they once were. Among the official poor, half have computers, 43 percent have central air conditioning and 36 percent have dishwashers, report Meyer and Sullivan. These advances are especially impressive because the massive immigration of unskilled Hispanic workers inflated the ranks of the poor. From 1990 to 2007, all the increase in official poverty was among Hispanics. But LBJ’s vision of “a hand up, not a handout” failed miserably. … America remains a tiered society with millions at the bottom still living more chaotic and vulnerable lives. Government’s capacity to boost them into the mainstream was oversold. Although Head Start produces some gains for 3- and 4-year-olds, improvements dissipate quickly; one study found most disappeared by third grade. Schools are continually “reformed,” because they don’t produce better results. The War on Poverty became the welfare state. Marriage trends point to a gloomy outlook. Worse, the breakdown of marriage and spread of single-parent households suggest that poverty may grow. From 1963 to 2012, the share of families with children under 18 headed by a single parent tripled to 32 percent. It’s 26 percent among whites, 34 percent among Hispanics and 59 percent among African-Americans. Just why is murky. 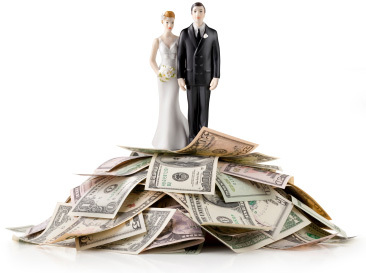 Low-income men may flunk as attractive marriage mates. Or, “women can live independently more easily rather than put up with less satisfactory marriages,” as Brookings’ Isabel Sawhill says. Regardless of the causes and despite many exceptions, children in single-parent households face a harder future. They’re more likely to drop out of school, get pregnant before age 20 or be unemployed. Handing out money is the easy part. The War on Poverty’s success at strengthening the social safety net — a boon in the Great Recession — should not obscure its failure as an engine of self-improvement. Government is fairly good at handing out money; it’s less good at changing behavior. The two roles intersect. If the safety net is too generous, it will weaken work incentives. If it’s too stingy, it will condone suffering. This tale of two wars has left the fight against poverty in a costly and unsatisfying stalemate. Does ‘expanding equality of opportunity increase inequality’? It seems that expanding opportunity leads to increased inequality. Would higher taxes be a good solution? Since “families are the primary transmitters of human capital”, does it follow that “expanding equality of opportunity increases inequality because some people are simply better able than others to exploit opportunities”. This is the premise explored by George Will in a Washington Post opinion piece last year. Some lucky, privileged “people are simply better able than others to exploit opportunities”. Would raising taxes on rich people reduce inequality? Recognizing that a meritocracy doesn’t always work very well for people lacking supportive families or other advantages, Matt Yglesias proposes that the government should tax rich people and “give the money to poor people” as a way to make everyone happy. Should we guarantee everyone a “great” life? ,,, When you think about physical disabilities this becomes particularly clear. We try to help out people who are blind or who lost a leg in Iraq or who are born with a congenital heart weakness not because providing such assistance accords with a principle of merit, but precisely because people who lack “merit” in the field of seeing or walking or not dying as a child due to heart failure are the people who need help. But lots of people suffer from less visible problems, be it a genetic weakness for alcoholism or the below-average intelligence that afflicts exactly 50 percent of the population. Those people should have great lives, too. More money is not the solution. The rich already “pay an overwhelming majority of the taxes in the United States”, but presumably Yglesias means their taxes should be increased. As much money as we throw at them, I don’t think we can provide every disadvantaged person with a great life. Add on the problem “that you eventually run out of other people’s money”, and this doesn’t seem like a good solution. Money can sometimes help improve lives, but it must be spent wisely. Politicians and bureaucrats don’t have that part quite figured out, and it seems that the more money we give them to control the less effectively they spend it. Posted in financial aid, parenting, preparing for college | Comments Off on Does ‘expanding equality of opportunity increase inequality’? Social factors also play a major role in denying opportunity. The truth is that the greatest tool to lift people, to lift children and families from poverty, is one that decreases the probability of child poverty by 82 percent. But it isn’t a government program. It’s called marriage. National Review Online clarified that “cajoling impoverished single mothers into marrying men who don’t have particularly bright labor market prospects” is not the solution proposed by Rubio or other conservatives. Rather, the idea is to encourage marriage before having children. Even amid strong resistance to this idea among liberals, the New York Times has reported about the effect of marriage on poverty. … changes in marriage patterns — as opposed to changes in individual earnings — may account for as much as 40% of the growth in certain measures of inequality. Another notable trend is how the rise of assortative mating has increased income inequality. … Income inequality has gotten worse in past decades in part because college-educated, high-earning men and women are more likely to marry each other, rather than get hitched to partners with divergent education or wage levels. This is the finding of a research paper, “Marry Your Like: Assortative Mating and Income Inequality” authored by economists Jeremy Greenwood, Nezih Guner, Georgi Kocharkov, and Cezar Santos. The rich, married, and educated get richer while the poor, single, and uneducated fall further behind. … College-educated households are more likely to be married and thus more likely to have secondary earners contributing to household income. … “assortative mating” … married college-educated persons are more likely to have a college-educated spouse. Thus, they are more likely to have a spouse with high earnings. Raising the minimum wage may feel good, but don’t count on it to reduce poverty. A town near Seattle may raise the minimum wage to $15 an hour. Massachusetts is debating raising the hourly minimum to $11. And in the nation’s capital, Senate Democrats are pushing a bill that could raise the federal minimum wage to $10.10. Most minimum wage earners are between the ages of 16 and 24. Raising the minimum wage would reduce entry-level jobs. Raising the minimum wage would not reduce poverty rates. It’s not surprising that lower-income students are underrepresented at top universities. Family income correlates with many measures of academic achievement, suggesting this as a factor. And according to Caroline Hoxby, an economics professor at Stanford, there are many low-income students out there who are able to fulfill admissions criteria at these schools but are not applying. Among other reasons, these students often do not have access to knowledgeable guidance counselors who are aware that top schools typically offer generous financial aid. Most (about 60%) Pell Grant recipients come from families with incomes below $30,000, making it a useful indicator for low-income students. (Over 90% have incomes below $50,000.) 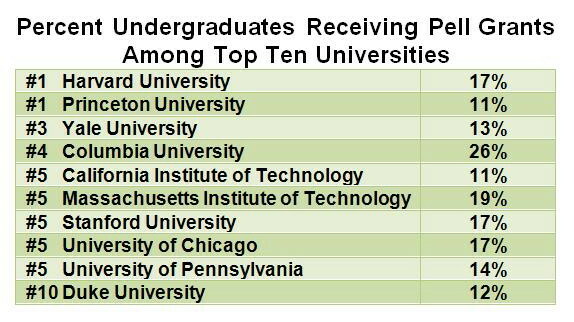 Here are the average per-school Pell Grant percentage figures for several categories of universities among those ranked on a national level by US News & World Report for the 2009-10 school year. Given the relatively low economic diversity at these universities, low-income students probably feel greater pressure to try to keep up with their wealthier peers than they might at many other schools. I recently heard about a student who was unable to attend a business symposium at an elite school because he didn’t own the proper attire.